I roasted it (in the toaster oven — I don’t turn the oven on in the summer months) tossed with olive oil, salt and lemon juice while we cooked up some risotto. We stirred in lemon zest and juice and a generous dose of parmesan at the end and finished with some parsley. Risotto is a staple in our house — adding the purple cauliflower took it from a high-fat treat to a high-fat treat with some great health benefits. 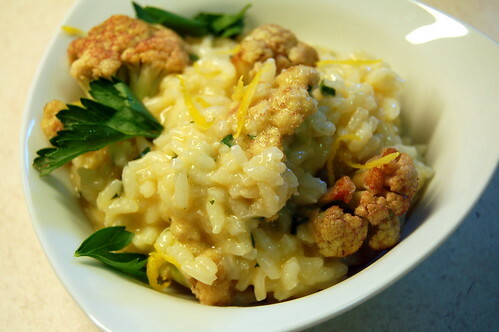 The cauliflower filled up the bowl so that I didn’t eat so much risotto, and added some nice crunch and flavor as well. That’s it for the broccoli and cauliflower this week; we finished up the broccoli with a stir fry.